This one was on Newborough Beach, Anglesey, one late December morning. You can just see the mountains of Snowdonia on mainland Wales in the distance. Lens-Artists: Splash Please visit the Lens-Artists to see their spirit-raising photos. 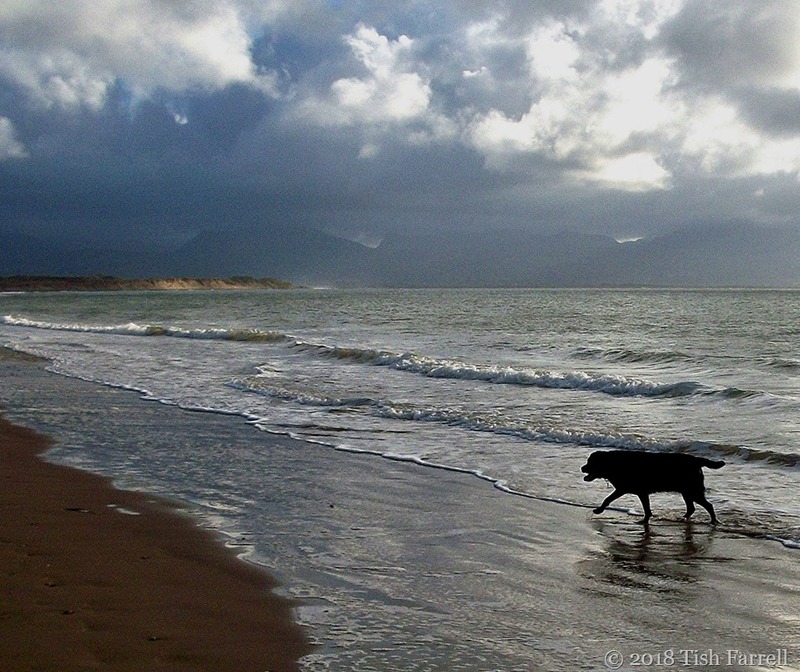 Posted on November 27, 2018 November 27, 2018 by Tish Farrell	This entry was posted in depression, mental health and tagged #Lens-Artists, Anglesey, depression, Newborough Beach, Ynys Mon. Bookmark the permalink. ← So Do We Want To Know What Britain Is Really Like For 14 Million Of Its Citizens? Like the picture very much. As for black dog days… I prefer not to discuss them… nor see the video. Fair enough, Shimon. I wasn’t discussing them either. The point was to maybe open the door a chink (i.e. the short video) to anyone who might feel they were the only person to feel that way. It would be helpful if the makers of videos like these considered the negative impact this film has on the many black dogs in shelters, who have ended up there through no fault of their own. Black Dog Syndrome relates to the issue of black dogs being frequently passed over for adoption in favour of lighter coloured dogs. They linger longer in shelters, sometimes for years. The Dogs Trust, Retired Greyhound Trust and others have introduced ‘Black Dog Days’ to encourage more people to adopt black dogs. Sharing videos like these does not help their plight. I’m sorry you think this. This term for depression is quite a long established one and in common usage. Oh, I know very well what a black dog is for I am a living proof, Tish. I’ve seen this vid many times. I use WP as a platform to write about mental “wealth”. At any rate I love the mood of your shot. Mental wealth – I like that, Perpetua. As Robert Plant sang on Led Zep IV. Thanks, Ark. That’s a nice black dog yarn. I also used have several black labradors. One, perversely was called Grey. you can fix the typo if you fancy. Wonderful, thoughtful, shots. Interesting, thoughtful video. But your commenter is quite right to point out how bad it would be for any black dog who happened to see it. Good timing Tish, the days are getting shorter and many people will be sharing their lives with the BD. It is a bad time for very many people, isn’t it. I think in the past there were very good reasons for all those winter festivals with singing, story telling and dancing and thanksgiving, and big bonfires – that in some cases lasted all through the darkest times. If people think a black dog is literally going to bring them bad luck or going to be a bad dog if they get one from the shelter then that says a lot about their intelligence lol. Thank you for those personal thoughts and experiences, Athena. It’s a big step, isn’t it, embracing the knowledge that depression isn’t all of who you are. Objectifying it seems to me to be a way of realising it can be managed, whatever measures you may chose in the attempt. Yes Tish. It’s difficult to talk about with so much taboo around it. Although when people talk about it its making it easier for those going through it. Doesn’t everyone get a touch of depression at times. ? I think the little video is brilliant. Perfect video! Sending this to someone I know who needs it. Thank you! I have two black dogs, but they are funny and they cheer me up. But I have been in that dark place and I had to dig myself out of it. I’ve been very careful to not go there again. It was ugly. You have made an important point here: that choice can play its part. Thanks, Ann. I liked the way the video brought a fresh perspective too. It let in the possibility for hopefulness. Beautiful image, Tish. A glimmer of thankfulness in winter. Your photo is lovely Tish. Thanks for posting the video — it’s really good. Glad you liked the video – brief but lots of active wisdom in’t. I can’t watch the video right now, but I like your shots and found the comments illuminating as well. A very good post and reminder. And yes, many of us need to manage through the darkest days of the year as well. If it gets dark too long, then I guess it is the dog getting bigger. I will send this to someone I know will need it. Thank you for posting! Many thanks, Leya. It’s very good to know you have someone who might get some benefit from this little film. A different black dog day. Love the captured with the mountains in the background covered in dark clouds. Hi Tina. Yes we need to open the windows and doors on the topic. Quite apart from anything else, it seems that people who admit to suffering from depression to employers, can find themselves severely disadvantaged in the work place to the extent of being laid off altogether. Very sad. Lovely, thought-provoking post, Tish. This topic was also discussed in an article about Bruce Springsteen that I read earlier today. Many more people suffer from depression than we realize. I appreciate the courage it takes to write about it. Many thanks for those added insights, Patti. I don’t think we appreciate the scale of the problem – from the small-scale ‘just getting by’ to the life threatening. Must chase up Bruce. Trish your photo shows perfectly natures beauty rain or shine. The video did not impress me. Because on dark days I accept all things are subject to change. Behind the clouds the sun still shines. Love the photo of your dog on the beach! Not my dog alas, but I used to share her on holidays.